When you decide to build a website or blog to promote your books, the first decision you will have to make is what domain name you are going to use. Domain name registration is quick and inexpensive. In most cases, your web hosting service provider is connected to domain name registrars, and you can choose top level domain names for less than $10.00 a year. But before registering a domain, or even a free domain, you should do your homework first. Domain names or domain name system DNS, which are more commonly called URL web addresses, need careful consideration. The URL that your new site will use is one of the primary ways people will find your website. It will show in the address bar of a browser and more importantly, and hopefully, be indexed by Google, Bing and Yahoo. However, what is not understood by most people new to website creation is that just like content on web pages, your URL can contain SEO keywords. But not every domain name contains natural keywords. You have to know how to include them. How can an SEO optimized name work for a new site for an author? Think for a moment about how people are going to find your new website. If they don’t know your name, what good is using your name in your domain name? 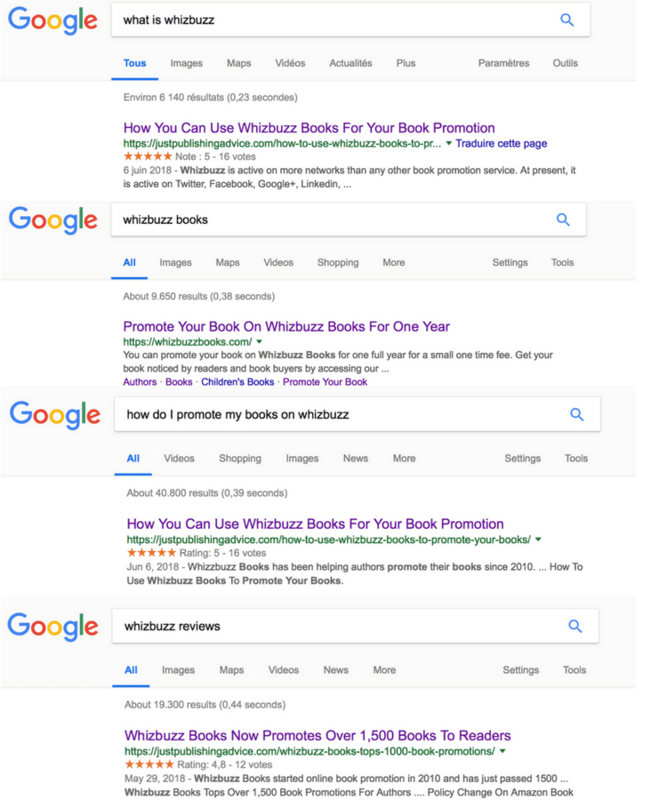 If they don’t know the title of your book, how can they search for it on Google? You can add a site link to your Facebook pages, Twitter or on book promotion sites but how many people click on these links? Like any product or service, books and authors need to be discovered. You need to help people find you through their web browser so they can buy your books. Because finding people to get your book is foot-in-the-door hard selling and doesn’t work online. But getting people to find your book is promotion and marketing and it does work online. The best way to help more people discover you and your books is through organic web search. Web search is based on keywords and phrases people use when they want to find something on the Internet. So you need to help them find you by selecting predictive keywords, and it can all start with your domain name. If you get it right, you will get a lot of visitors to your new site. So what are the do’s and don’t’s when selecting domain names? Before you rush in to buy a domain name for your site, here are some very basic mistakes you should avoid. 1. No one will search for you by name. Well, except for your close family and friends perhaps. So using your name in any form in your domain name is not going to gain much traffic. 2. You find a name you like, but it is already taken. So you add a hyphen or two, and you think have won. You haven’t. Hyphenated domain names are never a good choice as they diminish the SEO value of your site. 3. You have been told that short domain names are great. Well, yes they are, for companies like Apple, Google and Amazon. But you don’t have a well-known brand name that people will instinctively type into a browser bar. 4. You use your book title as your domain name, but your book title is ten words long. You can certainly register it, and it will work, but it will be chopped and cropped everywhere it appears. The optimum length for a domain name is between 10 to 25 characters. 5. Invented names and words from your books are great because you can always find a short URL. Yes, you certainly can. I did it too a long time back. I thought gloth.com was a great choice. Short and only five letters, so it had to be a winner. It wasn’t. It was a loser because no one ever searched for my invented word. 6. Using secondary extensions such as .net, org or country codes like .de, .fr, .co.uk or .com.au. Now let’s move on to the features of a domain name that can help you to help people, and especially readers, find you. There are three basic types of domain names. For most people starting a new website, the last option is usually the best. The key to an SEO optimized domain name is to find words that describe what your site is all about. You need to restrict your word choices to nouns, verbs and adjectives. Avoid prepositions, articles and linking words such as but, then, if, so etc. Then combine your word choices without hyphens. Before I set up Just Publishing Advice, I used my personal website and blog for many years. It was okay, but I didn’t get a lot of traffic because very few people searched for me by name. Primarily, because they didn’t know my name of course. Then, a couple of years ago I read an article about SEO optimised domain names. One line from that article is still stuck in my head. When I looked at the hundreds of blog posts I had written, they were mostly about writing, grammar, books and blogging. I was a bit slow because it took me two weeks for the penny to drop that I was writing about publishing. Now, two years after choosing my new domain name and redirecting my old blog to it, my traffic had shot up from a handful to 1,000’s of site visits per day. Before the site name change, I hardly ever ranked higher than 100 on Google. 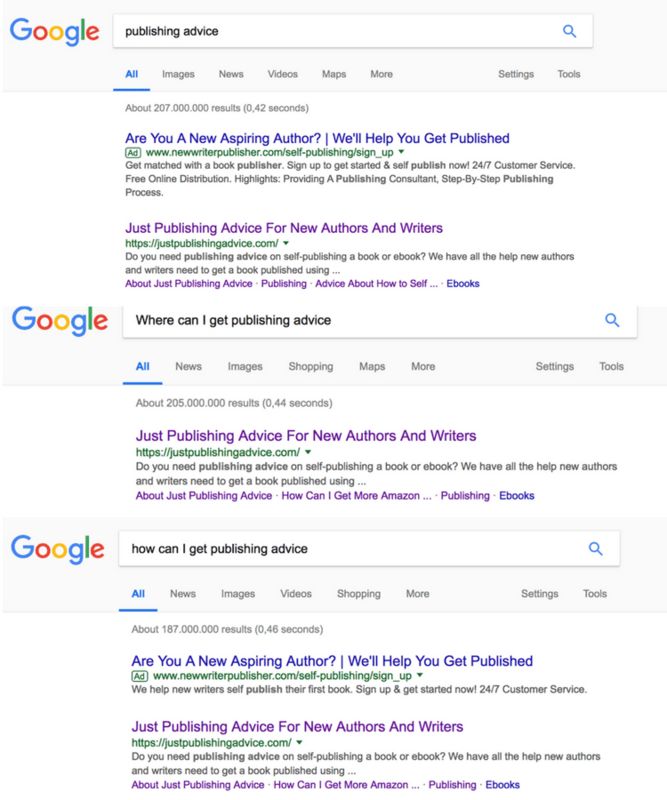 But now searches and questions for publishing advice rank at number one, or at worst, directly after paid google ads. The key ingredient of success is to laser focus down onto what you do, and how that can connect with people. Let’s say you write romance. Look for ways to express that with a compound noun or adjective-noun. A thesaurus can really help. I recall that some time ago, a post ranked very high on one of our sites with the keyword japaneselovestory. A quick bit of SEO research gave me these suggestions for a romance site. While the above are not guaranteed winners, you can get an idea about how you can build a keyword rich domain name that will attract much more traffic than a personal or branded name. If you want to use your brand name, perhaps in the case that you have set yourself up as a publisher, or you offer a service, then it can work. But it relies heavily on building name recognition. You need to concentrate on writing a lot of blog posts on your own and external sites and building backlinks. You need to write and post often enough for people to remember your brand name and then use it is a search. Social media is a great tool to further your brand recognition. All this will, of course, take quite some time to happen. But it can be done if you work hard and are very patient. Our sister site Whizbuzz Books now gains its traffic from name recognition in online searches. But not all searches result in a direct link to its site. External articles are very often the traffic drivers as you can see in the image below. Online searches for branded domains usually return fewer results than SEO optimized due to less competition for keywords. But, these are all still number one results on Google search. If you are about to start a new website, slow down and do your research before jumping in and buying just any domain name. Especially a name with hyphens. Most author sites I visit have domain names that do not work well in getting search engine traffic. Author names or book names take a long time if ever to gain public name recognition. It is far better to concentrate on finding a keyword rich domain name to help you attract more readers. Remember the advice I gave earlier. So yours should tell people that you write books and you can help them find reading enjoyment. The more people you can attract to your site, the more chance you have of selling books. If you already have a website and you are not getting the amount of traffic you would like, you can always change your domain name. It requires a little technical ability though. You need to install a permanent 301 redirect on your web server from your old name to your new name, and for every individual page on your site. If you are not sure how to do it, check with your hosting provider.